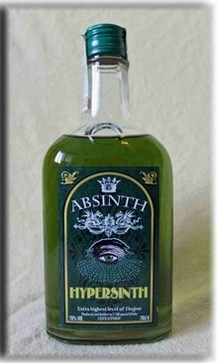 Absinthe Hypersinth - an absolute rarity is in Germany. It is available exclusively at the absinthe-dealer. Its fine aroma, with which the anise-content was held consciously very low, convinces through balance. Its wormwood aroma goes King of Spirits or La Bohemian tasteful easily into the direction. Absinthe-connoisseurs, that prefer rather anise-poor absinthe, will be filled with enthusiasm. Also the beautiful bottle-design contributes to the successful overall picture of this absinthe.